I’m using their materials with permission. In July, I’m presenting work related to data mining an archaeological database, in this case, the Portable Antiquity Scheme. I wondered, if I treated each district in the UK as a ‘document’, and the items recovered in its territory as the words, would I see any interesting or useful patterns if I ran some topic models? I put every record from Wokingham District into a single txt file, then every one from Winchester, until I was done (and I really need to automate that). Then I fed the text files through MALLET, using the JAVA Gui for this initial exploration (using the JAVA Gui’s default settings. In a more robust exploration, I would go direct from the command line, tweaking until I found the best number of topics, etc). What do those topics mean? To a human, they are all variations on the description of the artefacts. Given that multiple humans described these artefacts in the first place, perhaps (and it depends too on the kind of guidance and rigour that the PAS uses in its data entry) these topics gather some of the blurriness of categorization, a way of bypassing the clumpers and the splitters amongst us. Obviously, some more thought about what these may mean is necessary. But onwards! I brought the resultant ‘documents: topics, % contribution’ list into gephi for some visualization. Since it was a small dataset, I did no pruning. Topic 4 does the most lifting in this network. In its ‘module’, you find topics 9, 10, 3, 5 (coloured purple) and districts of Gravesham, Bromley, Dover, Canterbury, Test Valley, and New Forest. But how much weight does this visualization carry? Since it’s two-mode, and these metrics are really only appropriate for a one-mode graph, probably not much. So I collapsed this graph into a one-mode graph of district to district, based on weighted ties by topic. The resultant graph is probably more useful for archaeology, for it ties areas together based on all of the material culture recorded in the database. At the recent SAA in Honolulu, in the Connected Past session, folks were constructing networks from artefacts using Brainerd Robinson coefficients. The methodology I’m trying ought to be compared with those studies (see for instance Barbara Mill’s et al recent article). I then ran modularity and betweeness statistics again. Why betweeness? 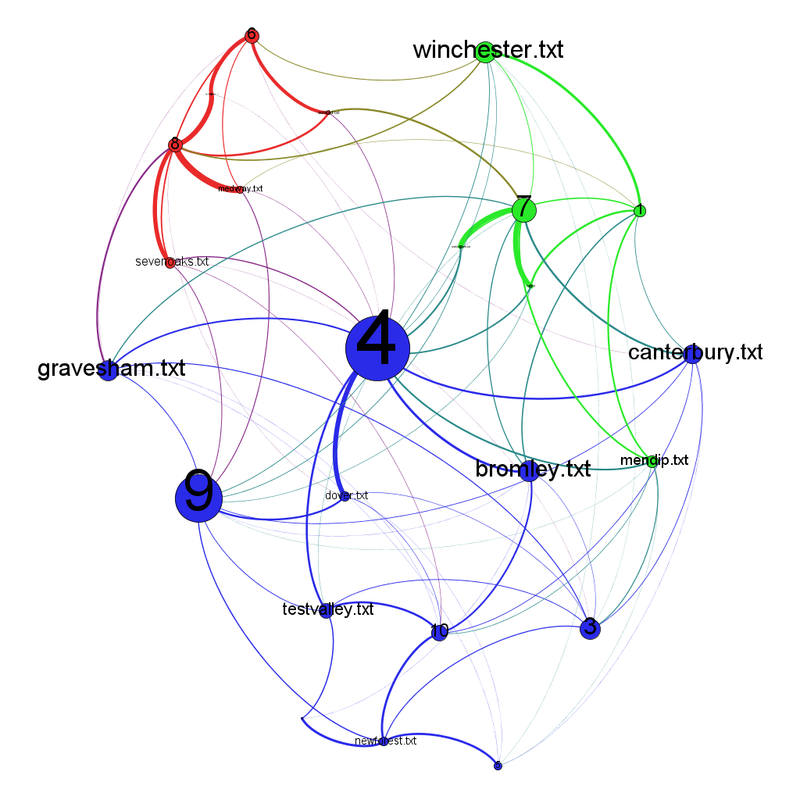 If the ‘topics’ that emerge in this database reflect something within the underlying material culture, then interconnections between sites constructed from topics show some kind of flow (of ideas? culture? economics? ), thus ‘between’ sites straddle the most important of those flows – in which case the most ‘between’ districts might be rather more important. Remarkably (and this could be an artefact of the method, rather than the underlying data), I get next to no variation in betweeness – every district except for East Hamphsire, Ashford, and New Forest has the same score (and these three all have the same score too). Modularity finds two groups. Perhaps it’s an east/west dichotomy? I laid the network out with the nodes at their geographic locations (typically, the district council office). No east-west dichotomy. (Incidentally, you can now export to Google Earth, overlaying your network against pretty satellite pictures). So… there seems to be something to it. The thing to do now is to do every record, every district, and every period, mapping out changes over time. In the interests of being able to assess this, though, I should perhaps stick to my knitting and just do the Roman period. I intend to present this at DH2013 at UNebraska, Lincoln, in July; there’ll definitely be more posts to follow. Thanks!